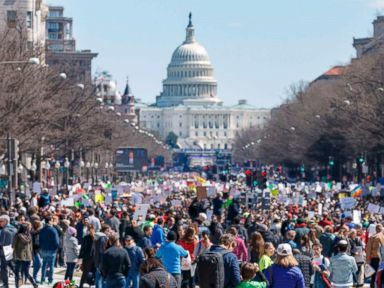 Hundreds of thousands of Americans, including children, student activists, concerned parents and angry teachers, are taking to the streets of Washington, D.C., and cities across the country in March for Our Lives rallies, demanding an end to gun violence. The events were organized by the student survivors of the Feb. 14 mass shooting at Marjory Stoneman Douglas High School in Parkland, Florida, that killed 17 people. 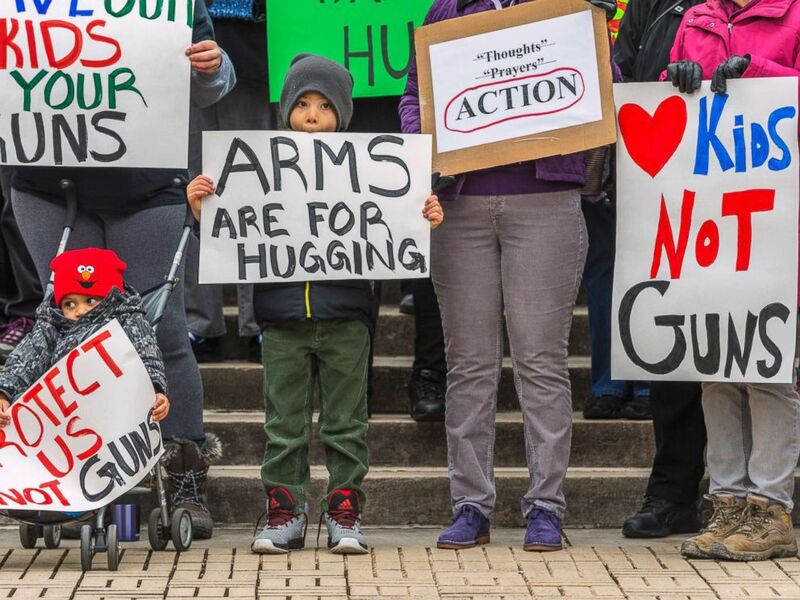 As children and adults arrived in Washington this morning, they streamed out of the front doors of the Union Station train station with homemade signs, some calling on Congress to pass stricter gun control laws, others criticizing the NRA, an organization they believe has too much control over the U.S. government. 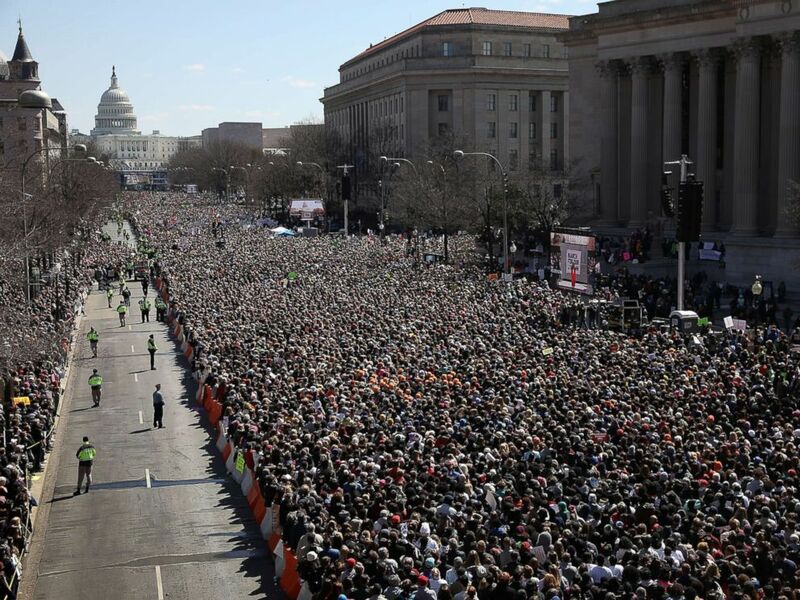 Demonstrators attend the March for Our Lives rally, March 24, 2018, in Washington, D.C. The Washington rally featured young speakers, including students from Parkland and others who have been personally impacted by gun violence. Many teenage activists urged their peers to register to vote and show up at the polls in the midterm elections. Their speeches were interspersed with performances from artists including Miley Cyrus, Ariana Grande and Jennifer Hudson. Overcome with emotion, one Parkland survivor, her voice shaking, led the crowd in Washington in a round of "Happy Birthday" in honor of slain Parkland student Nicholas Dworet, who would have turned 18 today. "It's only seven short years until we have the right to vote,” Naomi added. Dr. Martin Luther King Jr.’s 9-year-old granddaughter Yolanda Renee King told the crowd in Washington, "I have a dream that enough is enough." Martin Luther King Jr's granddaughter(L) speaks next to student Jaclyn Corin during the March for Our Lives Rally in Washington, D.C., March 24, 2018. 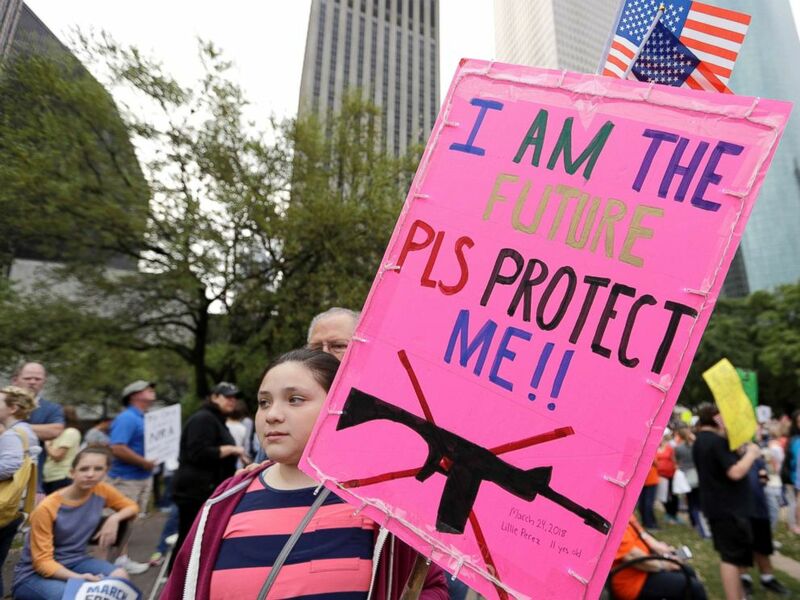 Lillie Perez, 11, holds a sign during a March for Our Lives demonstrations for gun legislation and school safety Saturday, March 24, 2018, in Houston. Demonstrators attend a March For Our Lives rally in Oxford, Miss., March 24, 2018. "This is more than just a march. 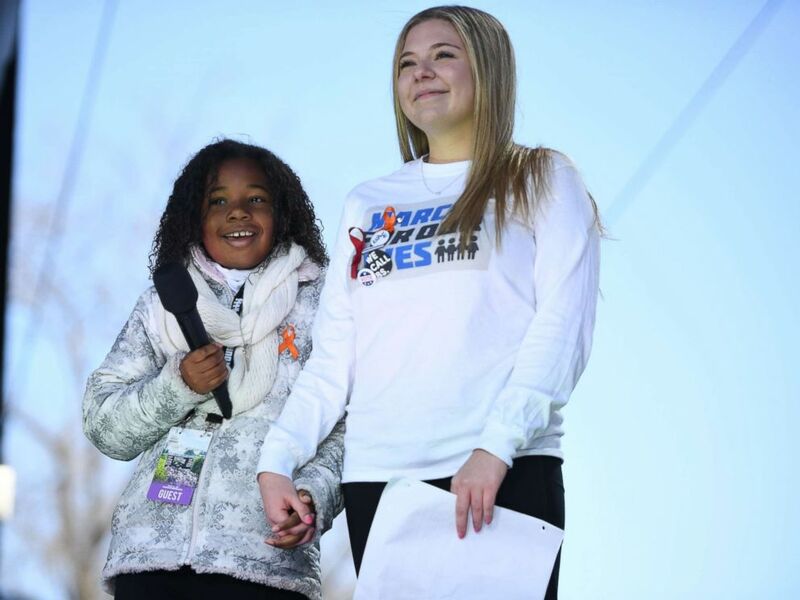 This is more than just one day ... this is a movement," Parkland survivor Delaney Tarr, 17, told the crowd in Washington today. Tarr said the country needs gun laws that are "more than a Band-Aid on a broken bone." "We cannot move on. If we move on, the NRA and those against us will win. They want us to forget," she said. "Today and every day we will continue to fight for those things that are right ... we will continue to fight for our dead friends. .... All for that assault weapons ban ... all for the prohibition of high-capacity magazines." "We're here to lead," she continued. "We're here to call out every single politician -- to force them into enacting legislation." Demonstrators attend a March for Our Lives rally, March 24, 2018, in Cincinnati. Rally goers demonstrate on Pennsylvania Avenue during the March for Our Lives rally in Washington, D.C., March 24, 2018. Ninety-six people die every day from guns in the U.S., but most lawmakers “have no public stand on guns," David Hogg, one of the more outspoken Parkland student activists, told the crowd in Washington today. “We are going to take this to every election” this year and make sure the “best people” run, Hogg, 17, said. “This is not cutting it,” he added, pointing to the Capitol behind him. He said the country must come together as Americans, not as Republicans or Democrats. “We will come together. We will get rid of these public servants that only serve the gun lobby. And we will save lives,” Hogg said. 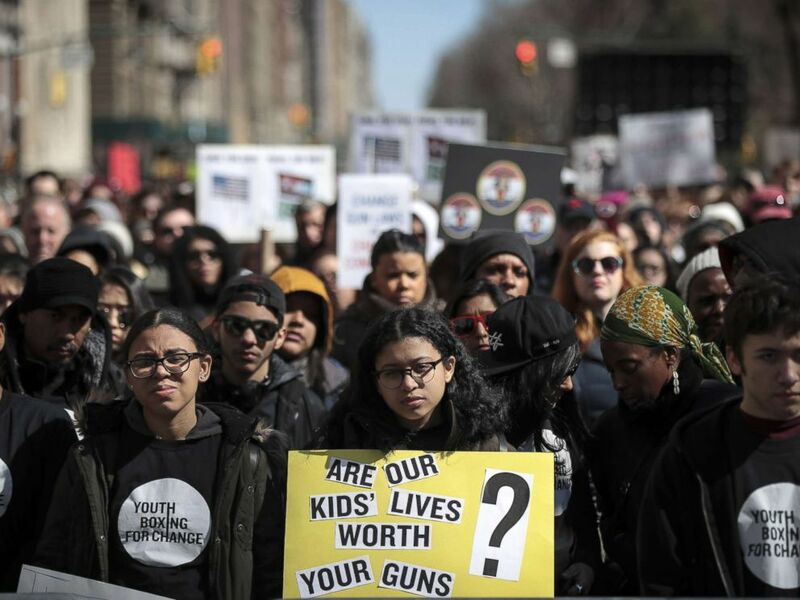 Demonstrators attend the March For Our Lives just north of Columbus Circle, March 24, 2018, in New York. Stoneman Douglas activist Emma González spent 6 minutes and 20 seconds on stage to bring attention to the time it took a gunman to kill 17 people at her school. After reading the names of victims, she went silent, tears rolling down her cheeks. The mood in the crowd was somber. Chants of "never again" started and a timer went off, marking the 6 minutes and 20 seconds. González, 18, told the crowd, "Fight for your lives before it's someone else's job." 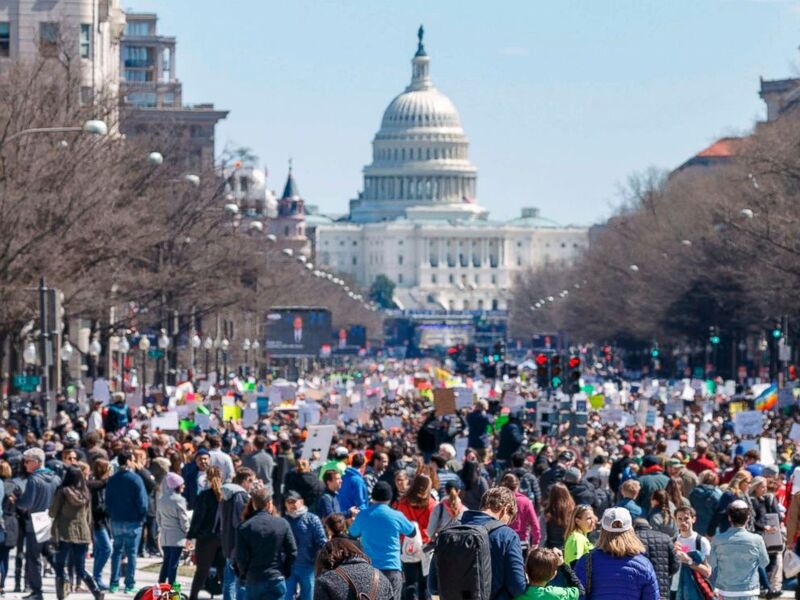 The main event took place in Washington, D.C., but the call to action drew massive crowds at hundreds of sister marches across the nation and the world. New York City's rally had 175,000 attendees, while 30,000 people marched in Atlanta and Pittsburgh, local officials told ABC News. Houston and Parkland, Florida, each had about 15,000 attendees at their events. Smaller cities like Tulsa and Jacksonville also drew sizable crowds. Carroll HS junior at #MarchForOurLives rally in Fort Worth, speaking about growing up in the "school shooting generation." 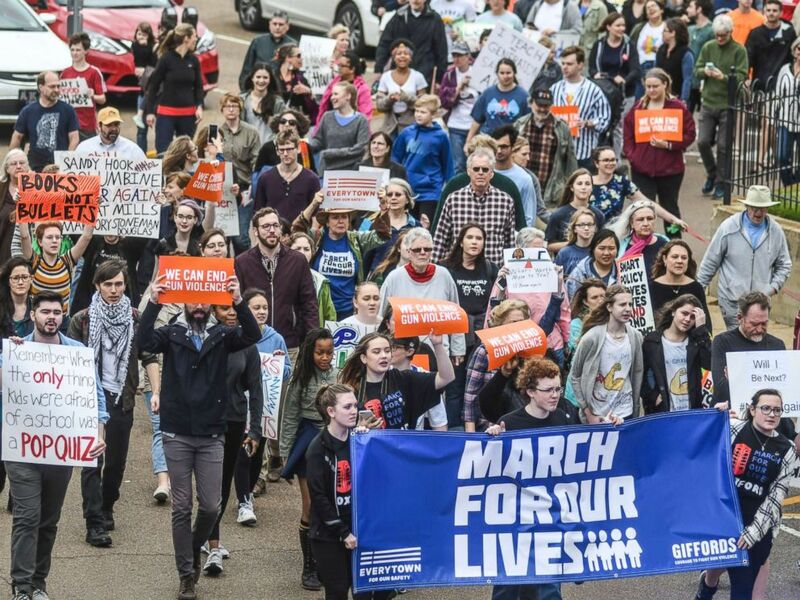 At today's rally in Atlanta, civil rights icon Rep. John Lewis, D-Ga., said to a cheering crowd, "We are never too young -- and never too old -- to march, to speak up and find a way to do something about gun violence." "We lost a leader that I got to know and work with 50 years ago by the name of Martin Luther King Jr. because of gun violence," Lewis said. "I am sick and tired of gun violence. I am sick of losing so many of our friends, our sisters and our brothers, our mothers and our fathers, our teachers and our students. We must stop it and we must stop it here and now!" 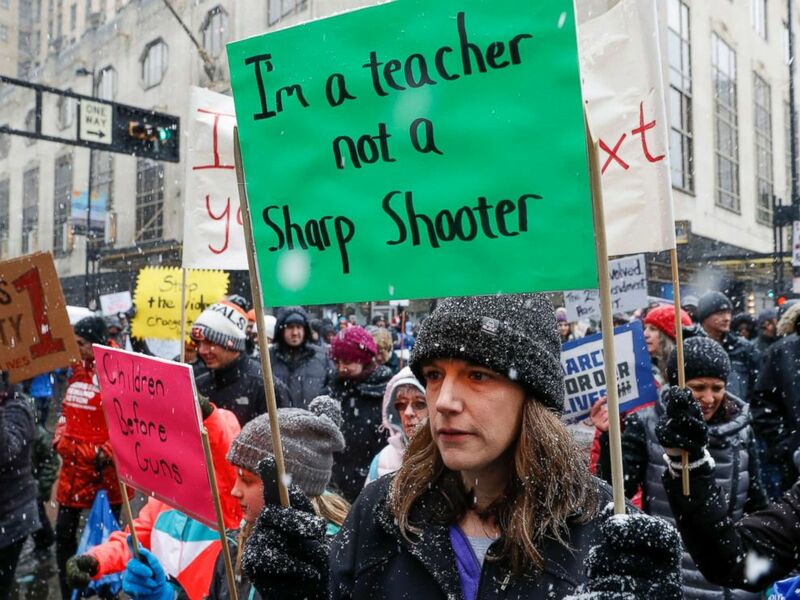 Kathy Gordon, an elementary school teacher in Norfolk, Virginia, said she was marching in D.C. for tighter gun control laws, including the banning of assault guns and stronger background checks. "It’s not just a school issue -- there are many mass shootings in this country that have nothing to do with schools,” Gordon told ABC News today. “Orlando, Las Vegas, Charleston. Those were not schools – those were churches, those were clubs, those were outdoor events. ... Arming school teachers or putting in an armed guard at the school doesn’t change any of that." Arming teachers would result in "unwanted disasters," Gordon said. “I want to teach kids. I don’t want to be armed. ... Arm me with my books." "I have three little boys. They're going into school and I really worry for them," Laurie, a mom from Philadelphia, told ABC News as she arrived in Washington, D.C., this morning. She said she thinks AR-15s should be banned. "After Sandy Hook we did nothing," she said. "It's heartbreaking." ABC News' Becky Perlow, Alexandra Faul, Fergal Gallagher, Josh Hoyos, Jason Volack, Aaron Katersky, Brendan Rand, Samantha Reilly, Morgan Winsor and Katie Kindelan contributed to this report.